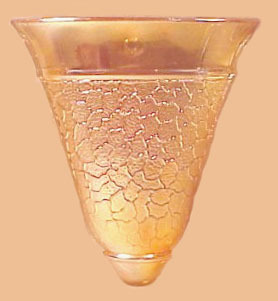 CRACKLE Pattern by Jeannette Glass Co.
A pattern with practical use in mind, this is one which was available in the ‘20s and early 1930s, when the Depression era of glassware began its reign. All of the shapes displayed here are found in marigold. The vaseline shakers are somewhat unusual. CRACKLE by Jeannette. 7 in. x 3 in. Bowl. 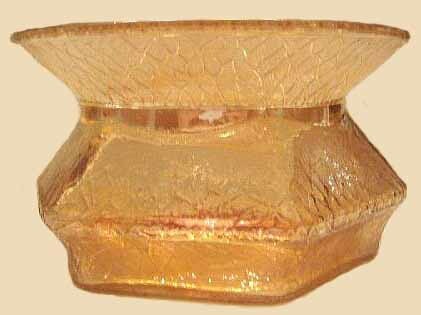 BOWL: This scalloped bowl (7”x 3”) could be useful as a small serving vessel for vegetables or fruit. 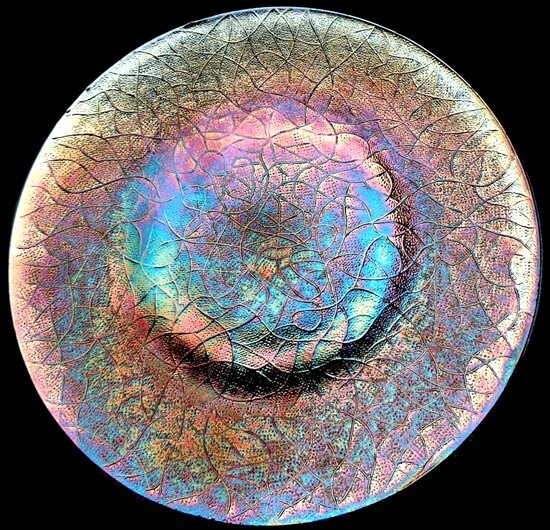 CRACKLE Sherbet - 5 in. high. 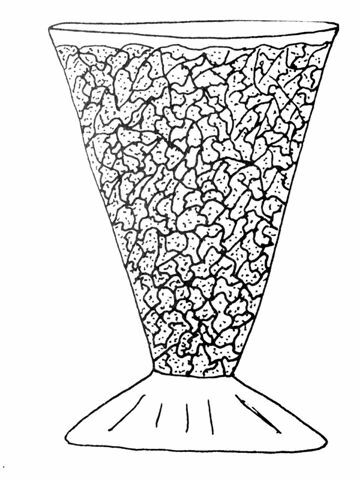 SHERBET: Not previously listed as a shape in this pattern, but in April 2009, nine of these were advertised for sale on eBay. PITCHER and TUMBLER: Items of basic need, these could be found in many homes during the late ‘20s – early ‘30s. 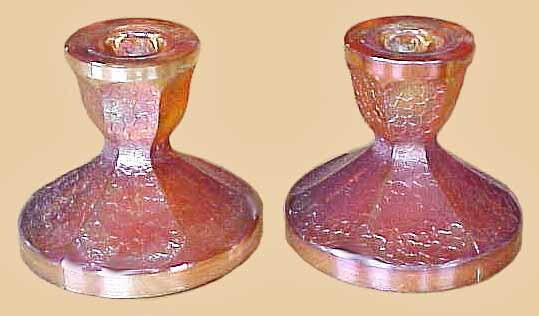 CRACKLE Candlesticks - 3.5 inches Tall. CRACKLE Candlesticks -7 inches tall. 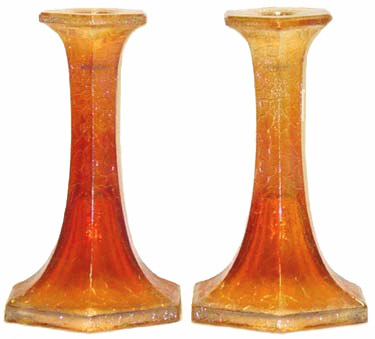 CANDLESTICKS: Prominence of these useful and decorative items is a good indication of the demand, with two sizes available. CRACKLE 8 inch plate in Marigold Courtesy Kate Lavelle. 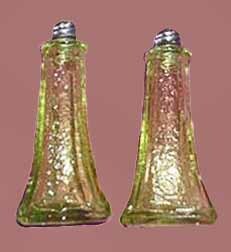 Light green or vaseline CRACKLE Shakers. SALAD PLATE and SHAKERS: Certainly these two utilitarian examples of the Crackle line would have had daily use! Crackle Candy Jar and Wall Pocket. 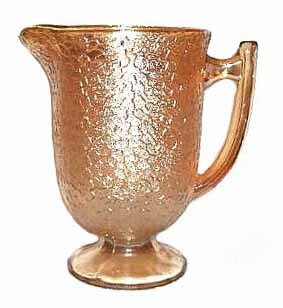 COVERED CANDY and WALL POCKET: The covered candy jars must have been made over a long period of time for they are readily available today in most shops dealing in antique glassware. 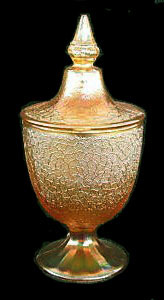 Wall pocket vases are rather a carry-over from the car vases used in the ‘20s - early ‘30s. to embellish “the ride”. 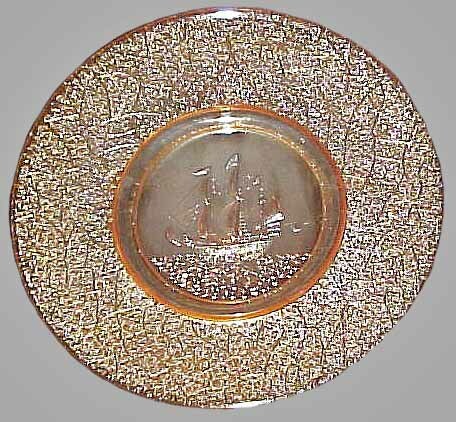 SAILING SHIP 8 inch Plate. Mid-Winter 1927 Butler Bros. Wholesale Catalog Ad. 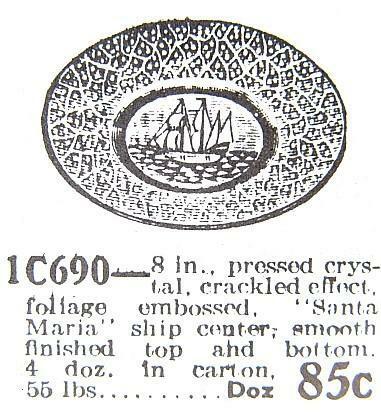 8” SHIP and STARS Plate: This 8” plate is the only size known within the pattern. Surprisingly, they seem few in number. We might assume that use as salad plates damaged quite a few? 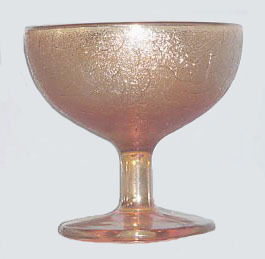 Crackle Spittoon shown in Mid-Winter 1927 Butler Bros. Ad. SPITTOON: Chewing tobacco was a habit followed well into the late ‘30s, but surely this must have been one of the “last of its breed” to have been produced. 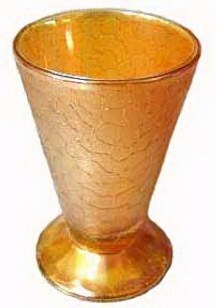 Christianity began in Judaism. As more and more non-Jews became Christians, the role of Judaism in the Christian faith became an issue. A group of Jewish teachers, called the Judaizers, taught that Christians must first convert to Judaism and follow Jewish ceremonies and practices in order to be saved. Paul’s writing of this letter (verse 6) affirmed that salvation is by grace through Jesus Christ, not by observing Mosaic law.